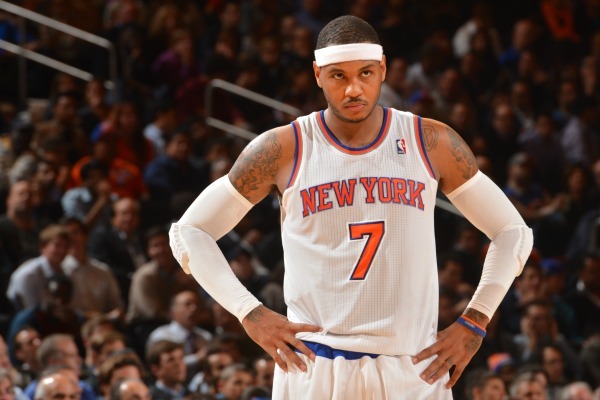 In a column for the FanRag sports network, Charley Rosen, a known Phil Jackson confidant, blasted New York Knicks superstar Carmelo Anthony. The line that left everyone questioning the article’s intentions? During Anthony’s post-game interview session with reporters on Sunday, Anthony was informed twice that the article was not written by Jackson but instead a close friend. Anthony, though, had no trouble connecting the dots, suggesting that it is a more than a coincidence that the writer who criticized him in the piece has a relationship with the Knicks team president. It doesn’t fell like a total coincidence that Rosen has thrown Anthony under the bus. Jackson has never been one to shy away from speaking his mind, but this is something different altogether. He talked about Anthony’s ball-stopping once and got destroyed; imagine the backlash he’d face for saying Melo has outlasted his purpose to the organization. At the same time, it’s not like Jackson has denounced Rosen’s work in the past. To the contrary, Rosen was the author of ESPN.com’s Phil Files, so the assumption is he has access to the Knicks president. None of this, at any rate, is a good look for the Knicks, who slipped to 18-23 and are now 2.5 games off the Eastern Conference’s No. 8 seed after a mostly lifeless loss to the Toronto Raptors on Sunday. Everyone in the organization needs to be on the same page for this thing to turn around, and they’re clearly not. As Anthony says, if Jackson wants him gone, the two need to talk. Anthony’s no-trade clause gives him the final say in the chat, but it’s a discussion that needs to happen anyway—if only for clarity’s sake.